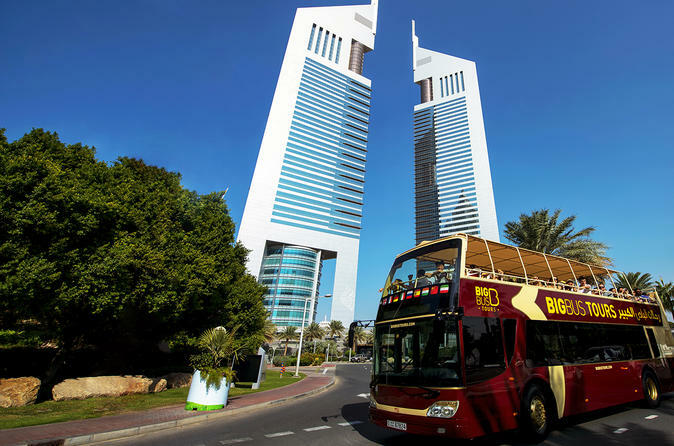 There is no better way to see Dubai than on a double-decker, hop-on hop-off Big Bus! 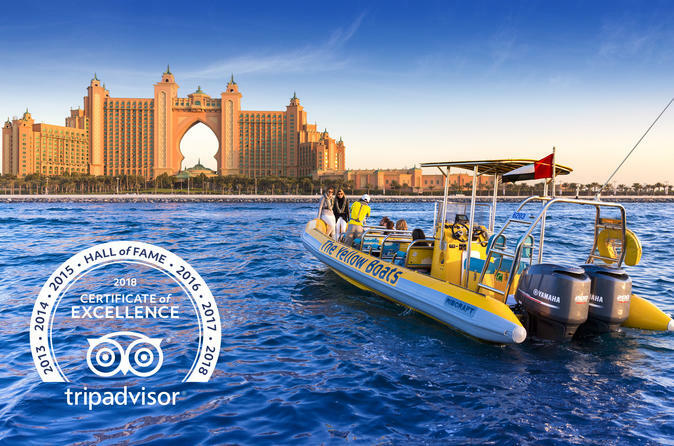 This comprehensive tour includes sights of top Dubai attractions such as the Burj Kahlifa, Jumeirah Beach Park, Al Fahidi Fort, Dubai Creek and more. Hop on and off as many times as you like on a choice of two routes for your choice of 24 or 48 hours of sightseeing. Both tickets include a range of additional benefits including an Arabian ‘dhow’ cruise, Dubai walking tour, Wafi shopping mall discount card and more! See the highlights of Dubai and its surrounding desert on this Super Saver that combines two best-selling tours over two days! Enjoy a city sightseeing tour by air-conditioned coach, seeing top Dubai attractions like the Burj Al Arab hotel and Al Fahidi Fort. Then head into the Arabian Desert on a 4x4 safari to visit a camel farm, try sandboarding, and enjoy a sunset barbeque meal with live music and dancing. 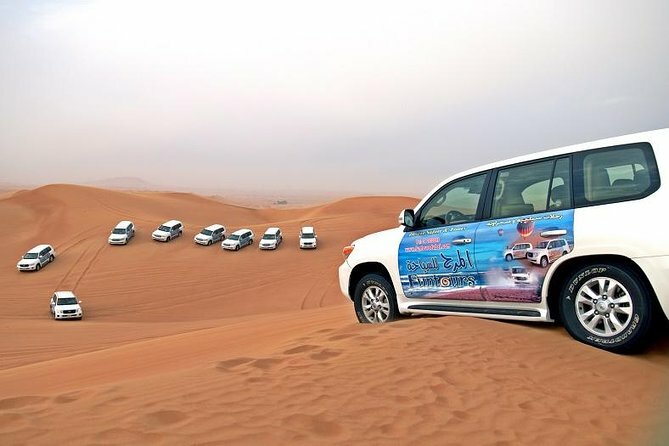 Each tour takes place on a separate day, and it’s your choice whether you do the Dubai City Half-Day Sightseeing Tour on Day 1 and the Dubai Desert Safari on Day 2, or vice versa. Dubai's Only Luxury Cruise with Freshly Prepared Meals onboard! Revel in the sights of nighttime Dubai on this memorable dinner cruise on the glass-enclosed ‘Bateaux Dubai!’ Enjoy a welcome drink and canapés and gaze through the boat’s wraparound windows as you cruise along glittering Dubai Creek to key attractions such as the Al Maktoum Bridge, Twin Towers and Grand Mosque, all illuminated against the night sky. Then, savor a delicious 4-course meal served at your table as a pianist plays in the background. Sip on a selection of sodas or house wines, depending on which option you select. 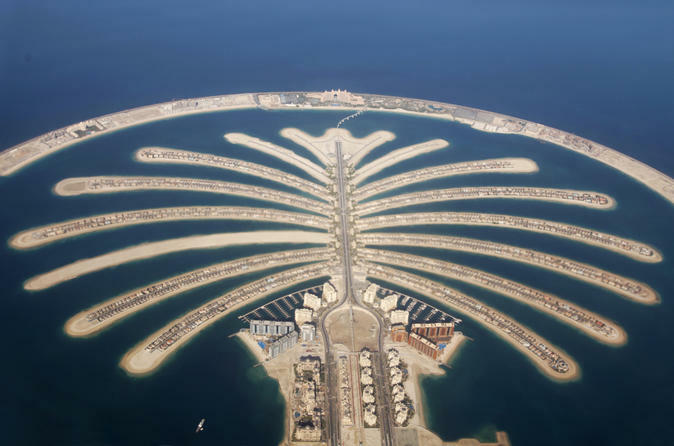 See Dubai’s flamboyant sights from the air on a 12,15- or 25-minute helicopter flight over the city! 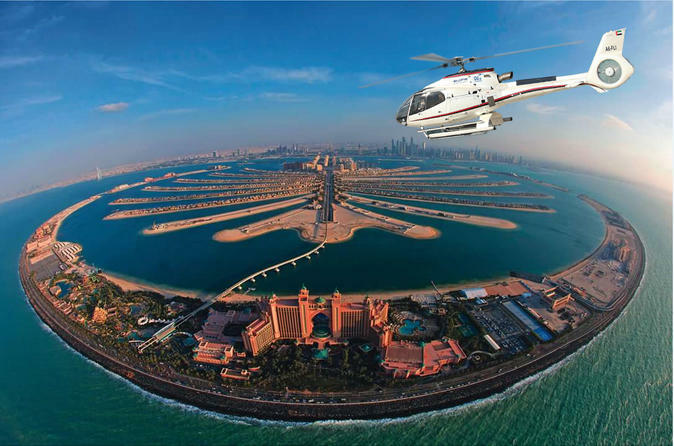 Aboard a 5-seater helicopter with clear glass sides, glide above the man-made archipelagos of Palm Jumeirah and The World, and loop around the cloud-reaching skyscrapers for which the city is famous. See the luxurious Burj Al-Arab hotel as well as Burj Khalifa, one of the world’s tallest — and most impressive — buildings. 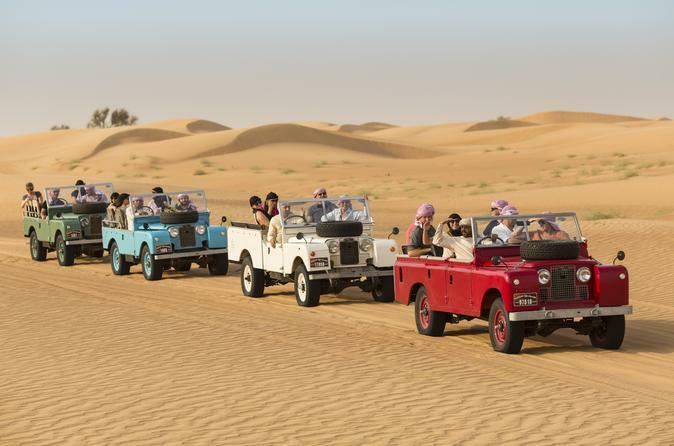 Venture into the desert and enjoy a quad bike ride, barbecue dinner and traditional Emirati entertainment on this 5-hour 4x4 safari from Dubai. 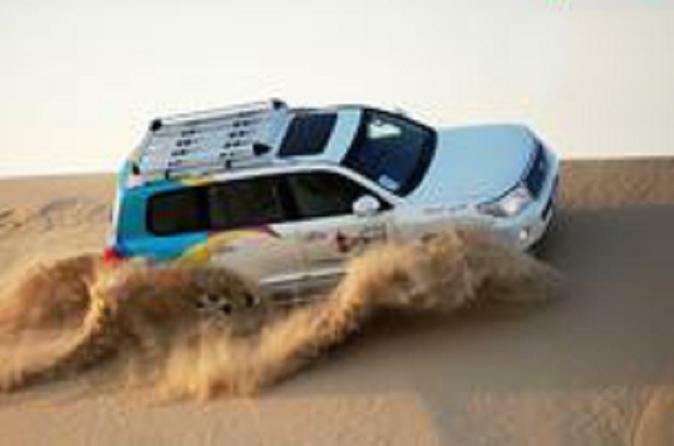 As the sun starts to set, scale the dunes on your 4x4 and arrive at a Bedouin-style camp for Arabic coffee and dates. Then, take an exciting quad ride, watch henna artists at work, enjoy a camel ride, and admire impressive sand art. 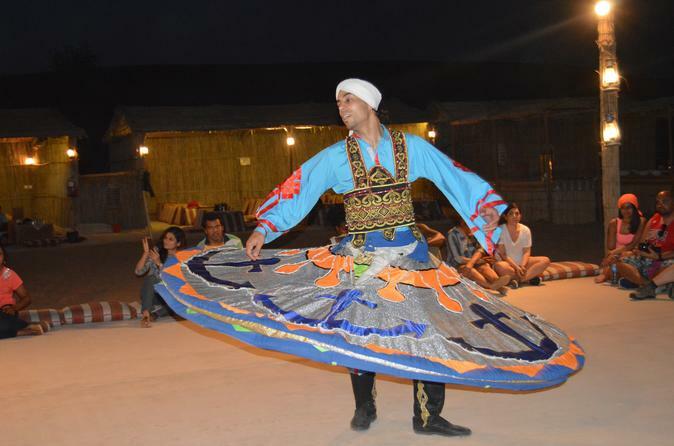 Finish with a barbecue dinner under the stars as you watch belly dancers and a ‘tanoura’ dance, with whirling dervish dancers spinning before you. See Abu Dhabi’s top city sights on a full-day sightseeing tour of the United Arab Emirates’ capital city! With a knowledgeable guide, visit impressive monuments such as Sheikh Zayed Mosque, and learn all about the city’s culture, history and attractions. Head out in your minivan to a short distance arriving at the Zayed Centre, a museum dedicated to the late Sheikh Zayed – a leader affectionately known by his people as the ‘father of the nation.’ Step inside and browse an impressive collection of Zayed memorabilia, seeing photos, his cherished cars and, even, gifts of stuffed lions and cheetahs. After learning about the man who is said to have shaped the United Arab Emirates, travel to your final stop of the tour and explore the Abu Dhabi Heritage Village - home to recreated Emirati souks and a Bedouin camp. 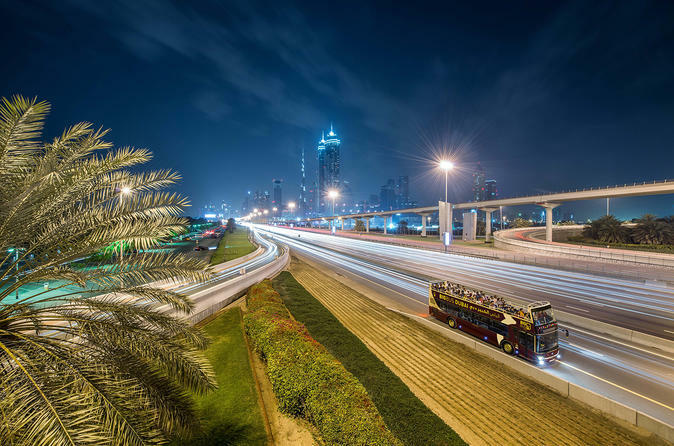 If you’re looking for things to do in Dubai, head out to discover the city’s main sights and cosmopolitan culture on a private sightseeing tour! This comprehensive Dubai city tour showcases a collection of top Dubai attractions, from beautiful Jumeirah Mosque to famous landmarks like the sail-shaped Burj Al Arab hotel. From a private vehicle, see picturesque Dubai neighborhoods, and then explore Dubai's old quarter, Al Bastakiy, and Dubai Museum by foot. Cross Dubai Creek by 'abra' (water taxi) to Deira, visit the famous spice souk and enjoy free time to shop in Dubai Gold Souk. Plus, learn fascinating details about the city from a private guide! Glide up and away in a hot air balloon over Dubai Desert Conservation Reserve. 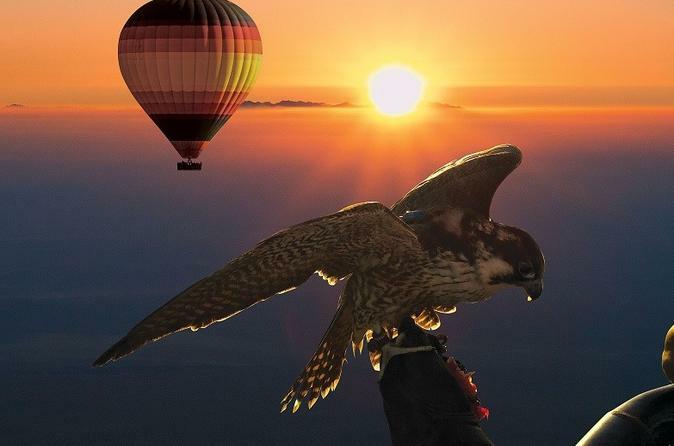 Take to the morning skies as the sun starts to rise over the Hajar Mountains and falcons fly up to 4,000 feet above the Earth in a trained demonstration from the Balloon. After an hour in the air, return to ground to celebrate the flight with a gourmet breakfast before returning to Dubai. 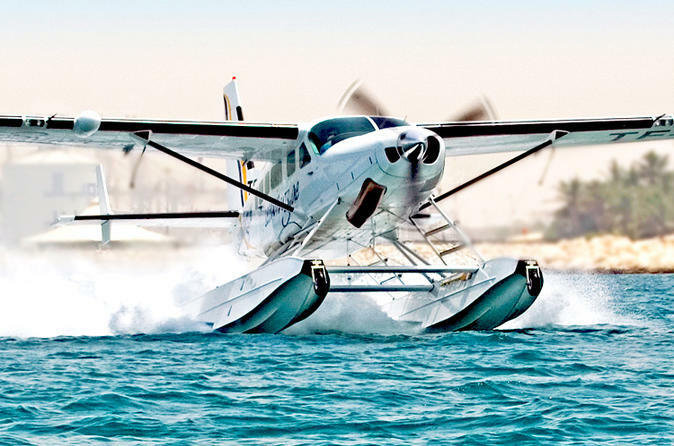 Speed around Dubai’s coastline on a 99, 75 or 60 minutes cruise by RIB (rigid-inflatable boat), and see Dubai Marina, the man-made archipelago of Palm Jumeirah, and more. 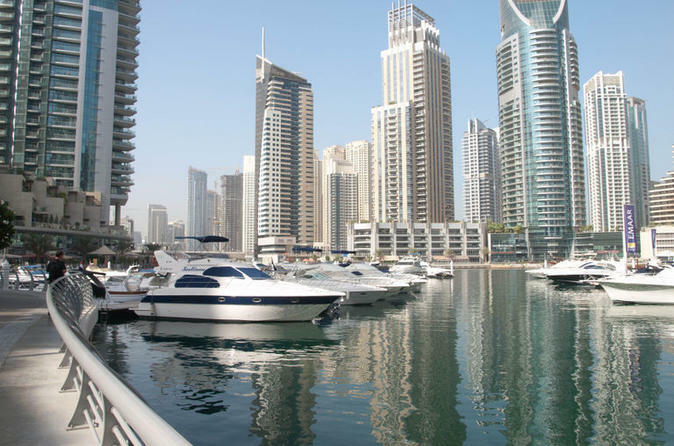 The boat is designed to maneuver with speed, as you enjoy close-up, unobstructed views of top Dubai attractions from the water. 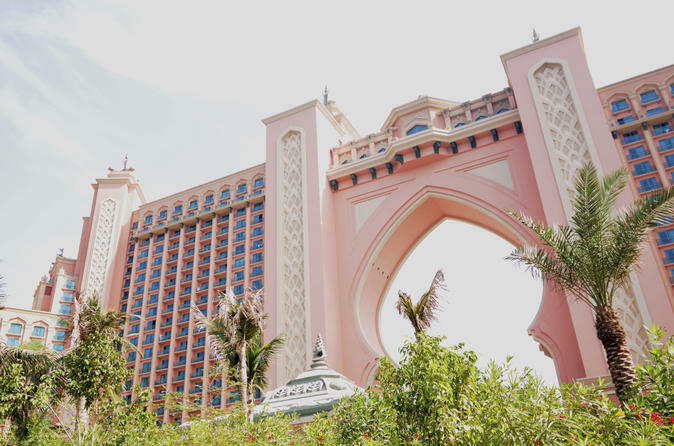 Pass prestigious hotels including Atlantis The Palm and Burj Al Arab, as well as several royal palaces and a Dubai lagoon. Your boat only holds a maximum of 10 people, ensuring a more intimate experience. 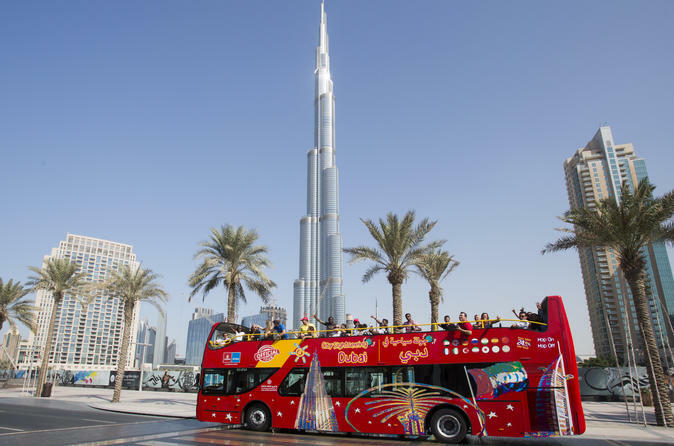 See Dubai's main attractions on a City Sightseeing hop-on hop-off bus tour. With your 24-, 48-or 72-hour pass, you'll enjoy unlimited sightseeing along five routes, taking you to more than 40 top Dubai attractions including Jumeirah Beach Park, Burj Al Arab, the Dubai Museum, Burj Khalifa, DIFC, Sheikh Zayed Road, Madinat Jumeirah, Gold Souk and Dubai Creek. Your hop-on hop-off pass includes a VIP Global Village entry ticket, an Arabian Dhow Cruise, walking tours, entry to select museums and more fun perks! Escape the hustle-bustle of Dubai to discover the ancient citadels, fishing villages, rugged mountains and desert oases of the United Arab Emirates’ captivating east coast. 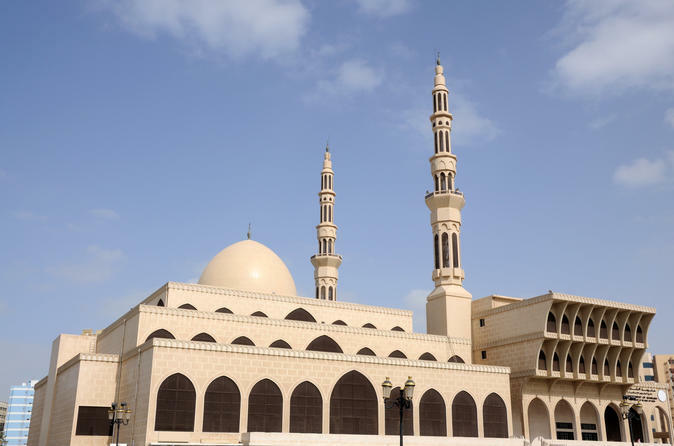 Traveling by air-conditioned coach through the Hajar mountain range, visit the towns of Al Dhaid and Dibba Al-Hisn, the recently renovated Fujairah Fort and Al Badiyah Mosque, the oldest mosque in the UAE. Take a dip in the Gulf of Oman, stop by Al Bithnah Fort and browse authentic Arabian wares at the Masafi market. 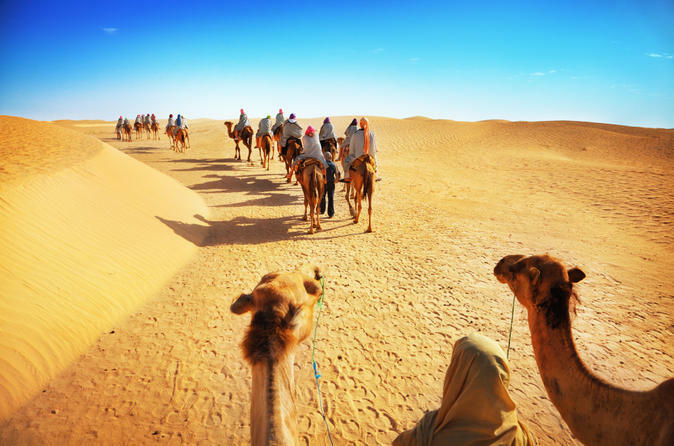 Spend a day in the desert with a private guide, and enjoy a camel ride and sandboarding session as well as a BBQ dinner and show under the stars! 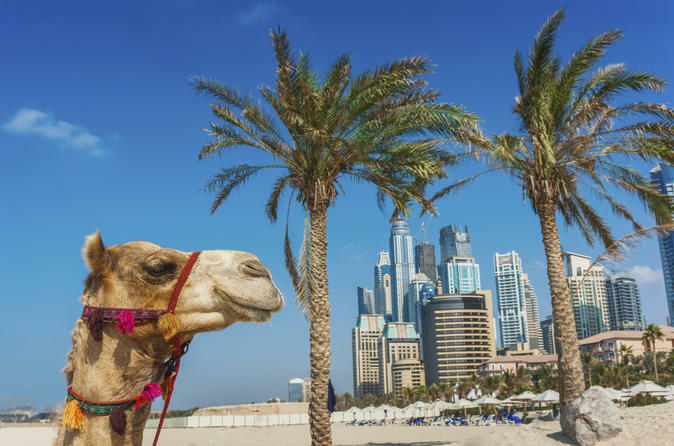 After leaving Dubai by private 4x4 vehicle, stop off at a camel farm for a ride, and then race down the sand dunes by sandboard before heading to a desert campsite for dinner and the folk- and belly-dancing show. If you want to experience another exhilarating activity, upgrade to include a 30-minute or 60-minute quad biking session that takes place roughly halfway through the day. 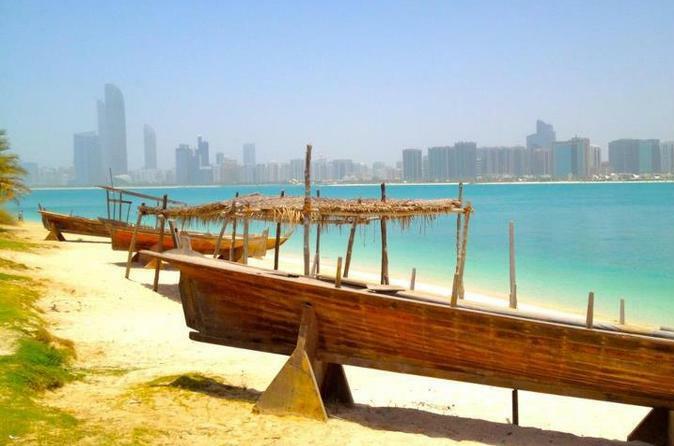 Explore Abu Dhabi with a private guide on this full-day sightseeing tour of the United Arab Emirate’s second city! 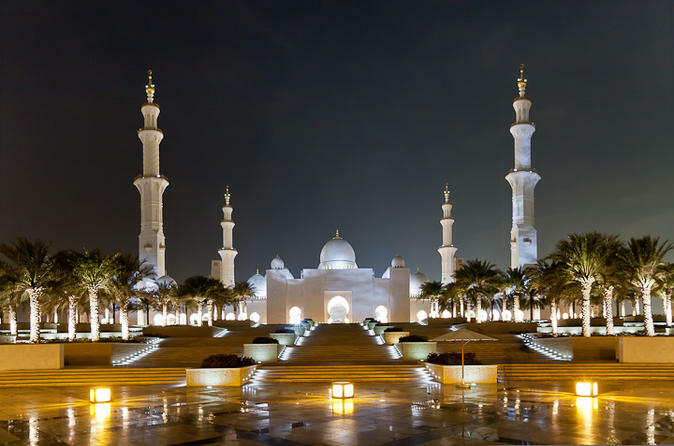 While visiting the city’s showstopping sights such as Sheik Zayed Mosque, learn all about Abu Dhabi’s history, culture and attractions and explore the Abu Dhabi Heritage Museum. If there is another attraction that you specifically want to see, simply let the guide know; the itinerary is flexible and can be tailored to your interests. 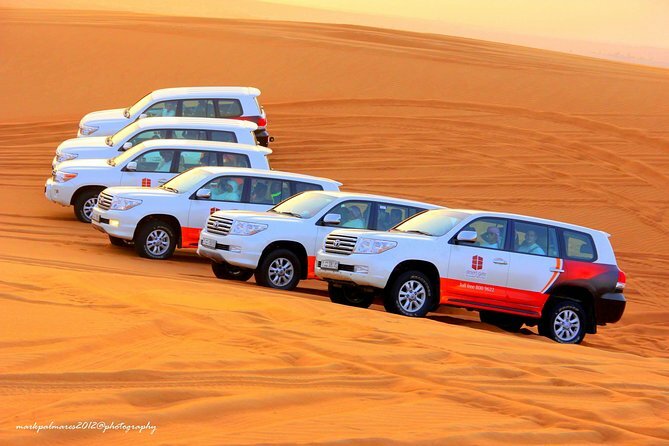 Experience four thrilling desert experiences on an exciting 4-hour morning tour from Dubai! 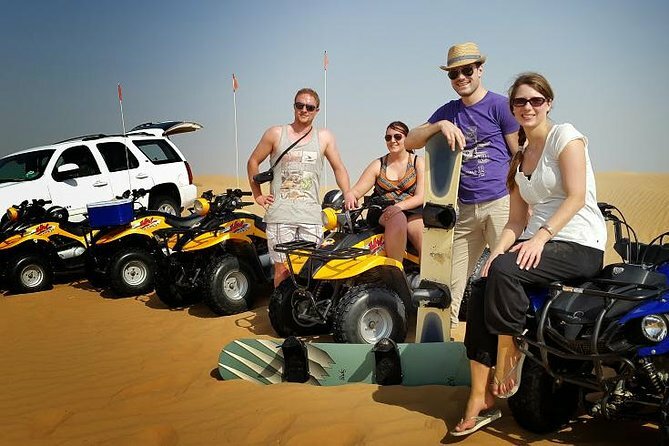 After heading into the desert bright and early in a comfortable 4x4 that’s driven by an expert guide, enjoy a quad bike tour across the rugged terrain, and feel the thrill of sandboarding down the orange dunes. Start your morning with a camel ride and visit a traditional camel farm, to capture snapshots of these humped animals and any cute baby camels in the herd. It’s four brilliant desert encounters rolled into one! 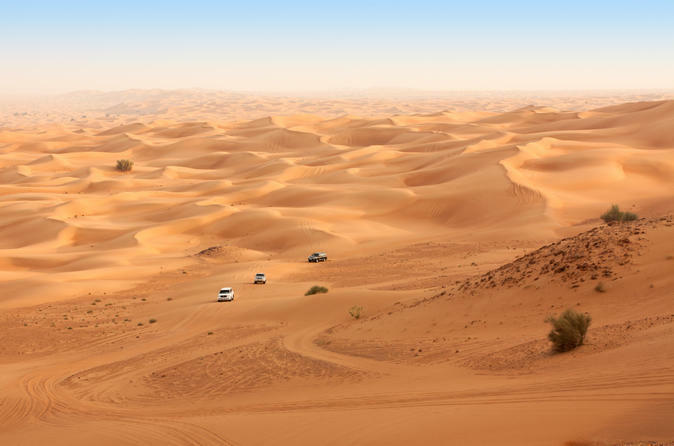 Enjoy an exciting dune bash and BBQ dinner under the stars on this 5-hour desert experience from Dubai. Travel into the rolling red dunes of the Lahbab region and feel the thrill as your 4x4 slides up and down the steep slopes. 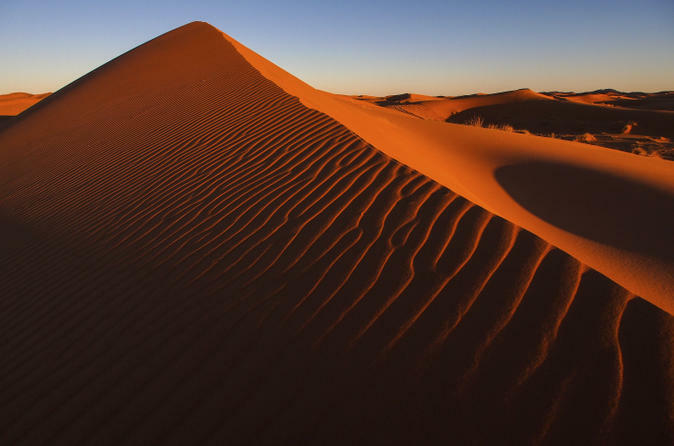 Stop for photos of the desert sunset and then head for a Bedouin-style tented camp to enjoy a camel ride, try sand boarding and get a henna tattoo. Lastly, savor a mouth-watering BBQ dinner as you watch colorful belly dancers and ‘tanoura’ folk performances by whirling dervish-style dancers. 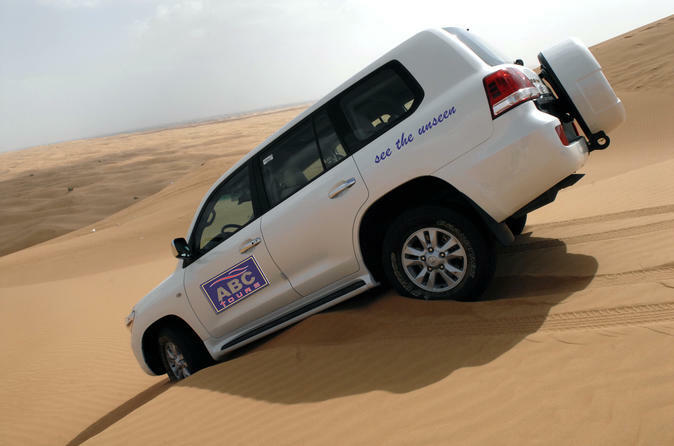 Explore the Dubai desert on a 6-hour 4WD adventure, and experience the golden dunes of Arabia. Take optional camel rides, get henna hand paintings, puff on an aromatic shisha pipe, enjoy a BBQ buffet dinner beneath the stars, and much more! Combine bird’s-eye views of Dubai from the spectacular Burj Khalifa with an indulgent afternoon tea at the Burj Al-Arab hotel on this enjoyable 5-hour tour. Snap photos of Dubai Marina and the sail-shaped Burj Al-Arab hotel, and then dig into a scrumptious afternoon tea. 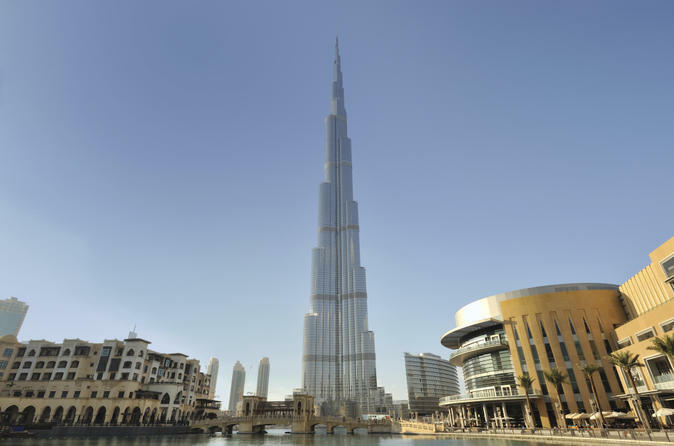 Next, zoom up to the ‘At the Top’ observation deck of the Burj Khalifa, the world’s highest building. Feel your heart skip a beat at the phenomenal views and then watch a dazzling Dubai Fountain show. Dubai never looked so good! 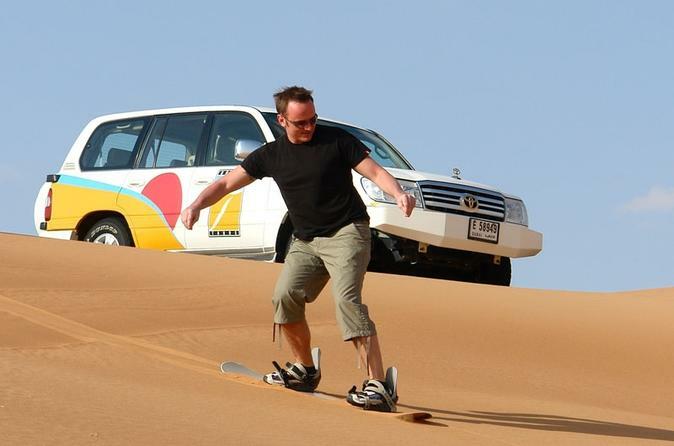 Give one of the most popular desert sports a go with this 4x4 sandboarding safari from Dubai. 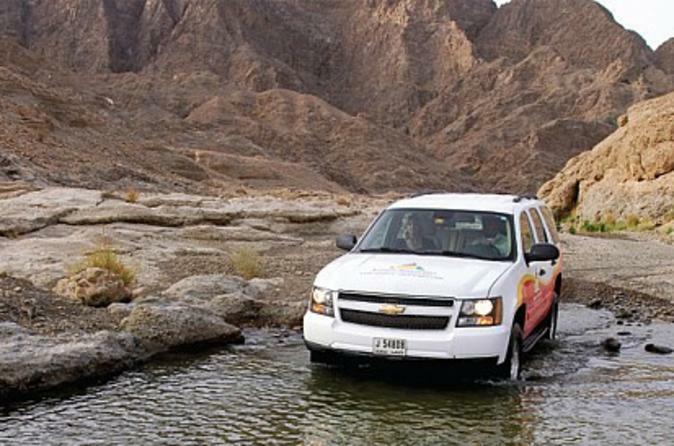 Board a comfortable 4x4 and travel to some of the best and most beautiful sand dunes in the desert. 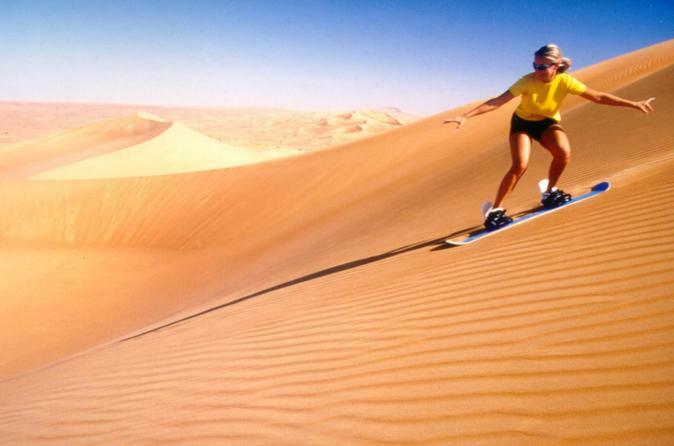 Then, after instructions from your expert guide, jump on to a sandboard to slip and slide down the sandy slopes! 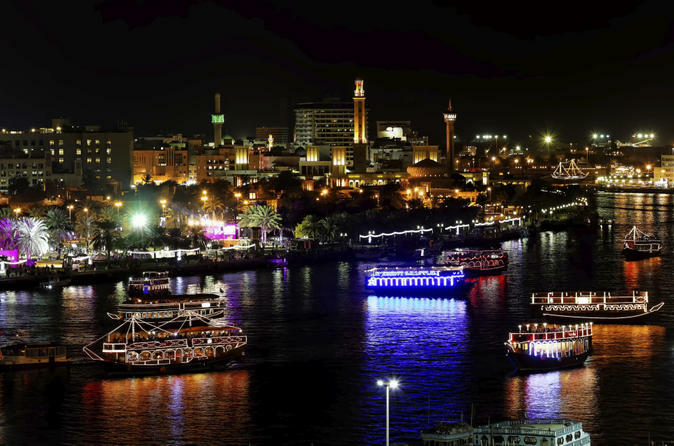 Cruise along Dubai Creek by 'dhow,' a Middle Eastern wooden boat, and see the sights of nighttime Deira while savoring a buffet feast! 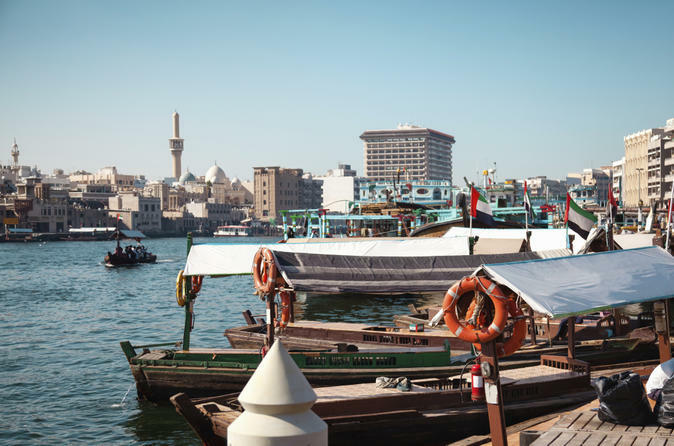 One of the city’s oldest neighborhoods, Deira represents the traditional heart of Dubai, and the 2-hour cruise takes in sights of many of its lively souqs and bustling side streets. Gaze out at the sights, and enjoy soft drinks plus Emirati and international cuisine from the onboard buffet, with charcoal-grilled meat and Arabic sweets alongside other countless other treats. 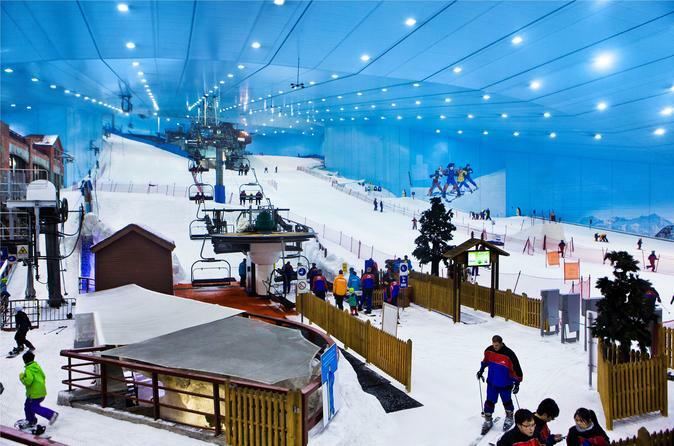 Enjoy your fill of snowy fun with this ticket to the family-friendly Snow Park at Ski Dubai. The Super Pass gives full-day access to the indoor Snow Park, the world’s largest. Toboggan down the slopes, try the twin-track bobsled, explore the interactive snow cavern, build snowmen and more. You’ll also see penguins waddle across the park, enjoy a chairlift ride and — if you’re feeling daredevil — ride the ‘Giant Snowball’ ride and try the extreme bobsled run. Access to the ski area is not included. As an integral part of desert life in Arabia, falconry goes back more than 2,000 years ago and is still extremely important to the heritage of Dubai. This is a unique opportunity to observe the world’s best-trained falcons and other birds of prey in an authentic setting in a Royal desert retreat. During this interactive falconry and birds of prey experience, our professional falconers will guide you through both ancient and modern training techniques. 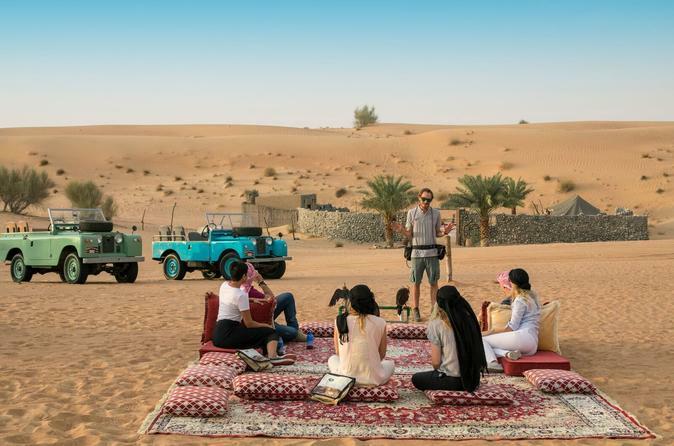 After this spectacular interactive experience, enjoy a delicious breakfast in our authentic desert camps before embarking on an adventurous wildlife drive in the Dubai Desert Conservation Reserve, the UAE’s first and largest national park. You will get to spot and learn about some of the iconic desert dwellers such as the Arabian Oryx from the comfort of a luxury Range Rover or vintage Land Rover, depending on which tour option you choose. 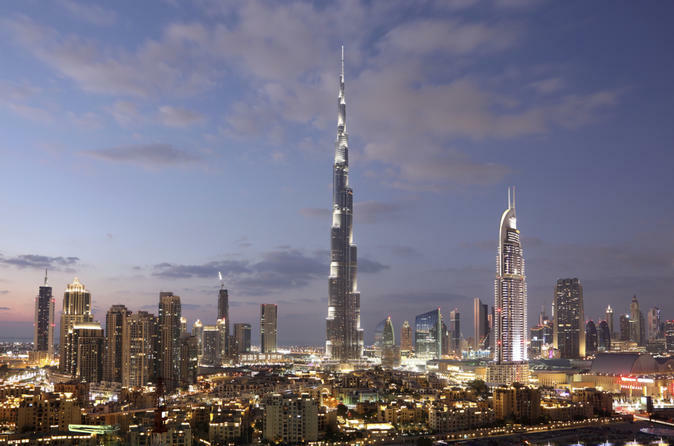 Get up close to Dubai’s most iconic 21st-century landmarks on this absorbing 5-hour tour! Famed for its boundary-pushing buildings, this is your chance to see many of the city-state’s architectural record-breakers with an expert guide. Wonder at the skyscrapers of Jumeirah Beach Residence, admire the sail-shaped Burj Al-Arab, and ride up to the 124th-floor viewing platform of the world’s highest building, the Burj Khalifa, for head-spinning views. 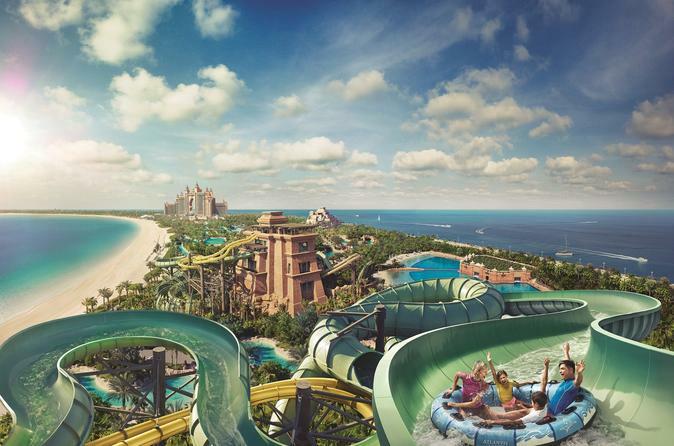 Cap it all with a visit to the incredible Atlantis, The Palm, on the man-made Palm Jumeirah, for a delicious afternoon tea. Enjoy a dinner cruise on Dubai Creek and a 4x4 desert trip with this Dubai Super Saver that combines two best-selling tours at a discounted price! 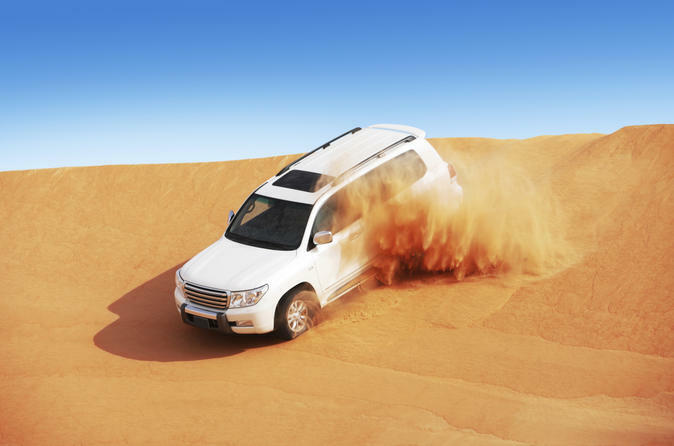 Ride a 4x4 into Dubai’s desert and enjoy dune bashing before visiting a Bedouin-style camp. Then, ride a camel and watch belly dancers and other Arabic entertainments during a sunset barbecue dinner. 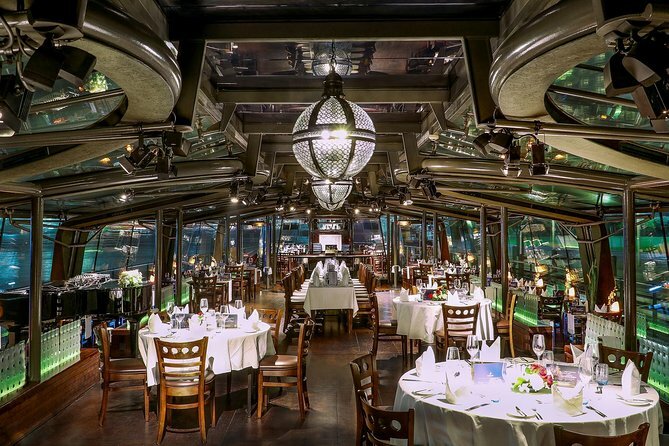 On the evening before or after, enjoy a dinner cruise along Dubai Creek. Board a 'dhow' (a wooden Arabian boat) and savor a buffet as you cruise past the glittering city skyline. 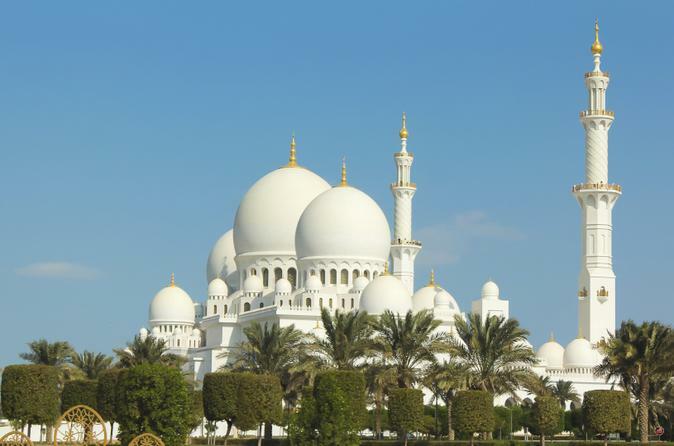 Discover the Capital city of the United Arab Emirates where you will visit the famous Grand Mosque (inside) and see the Emirates Palace, the most luxurious hotel in the world. On this day trip from Dubai you will discover how the cultural capital of the UAE was developed from a small fishing village to the modern and glamorous city it is today. 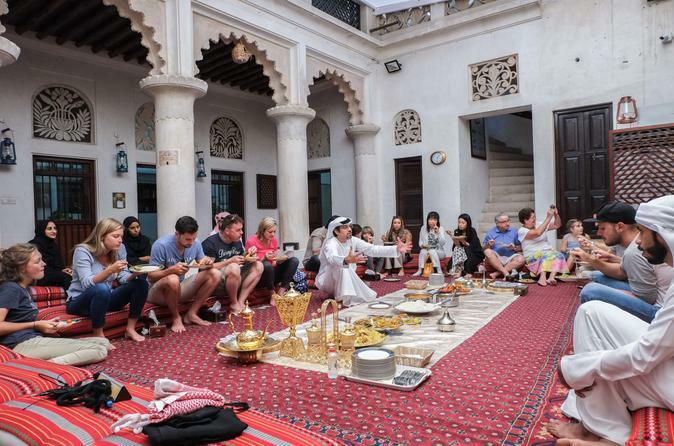 Enjoy an Authentic Emirati Meal and Cultural Talk in the one of the oldest areas of Dubai, Al Fahidi Al Bastakiya Historical District in our traditional wind tower courtyard. The Meal starts with Arabic Coffee and Dates and is followed by a selection of Emirati local dishes and desert featuring Ligamat and date syrup. After the meal your host or hostess will serve up tea and talk in our Landmark "Open doors. Open minds." 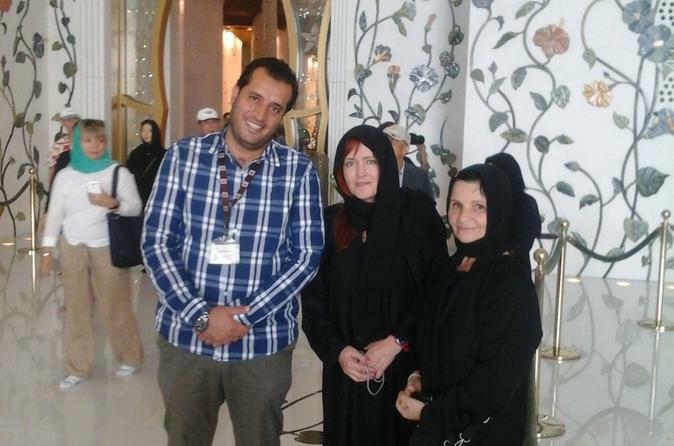 cultural exchange. Guests are encouraged to ask questions about local culture and as our motto suggests, no question is off limits. The session concludes with an explanation of the local dress, and guests are welcome to volunteer to try on the attire. With so much to do and experience, a visitor to Abu Dhabi will find it refreshing to see all the sights. This is a highly structured tour incorporating key sights and renowned attractions of this fascinating city.